Most omnivores associate crockpots with roasts, gently cooked until the meat falls apart in tender chunks, impregnated with a silky sauce. As a (mostly) non-meat eater, I still like to use my crockpot to create mouth-watering comfort foods like the five-layer vegetable strata we enjoyed last night. This recipe – based on one in Robin Robertson’s Fresh from the Vegetarian Slow Cooker – uses beans and pesto to create a savory sauce that envelops creamy Yukon gold potato slices and other complimentary vegetables. Use the best pesto and vegetable broth you can find for the most sublime results. In a blender, combine the beans, broth and pesto and blend until smooth. Spray the inside of your crockpot’s crock with cooking spray. Place a small amount of the pesto-bean sauce in the bottom of the crockpot. Layer in the potato slices and top with a bit more of the pesto-bean sauce. Repeat with each vegetable in the order listed, spreading a bit more pesto-bean sauce between each layer. Finish by topping the tomatoes with the last of the pesto-bean sauce and a generous amount of freshly ground pepper. Cook on low for 6-8 hours. Serve in bowls with a slice or two of crusty bread to soak up the sauce. Pure comfort! 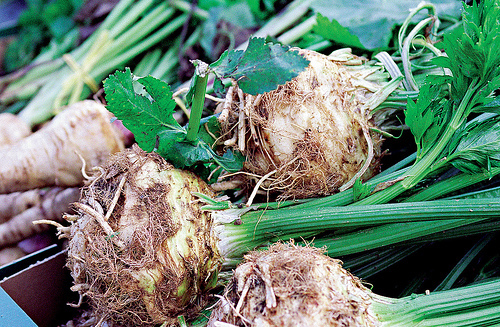 The knobbly bulb called celeriac or celery root has a celery-like flavor, but one that is more robust and creamy. This soup has only very simple ingredients to highlight the vegetables’ flavors. Heat a large saute pan over medium heat. Water saute leek and carrot until tender. Stir in wine, scraping pan to loosen browned bits. Add mixture to crockpot with celeriac, broth, and pepper. Cover and cook on low for six hours or until celeriac is tender. Place 3 cups soup mixture in a blender. Blend until smooth. Add pureed soup mixture back to crockpot. Add wild rice; cook 15 minutes. Sprinkle with chives.